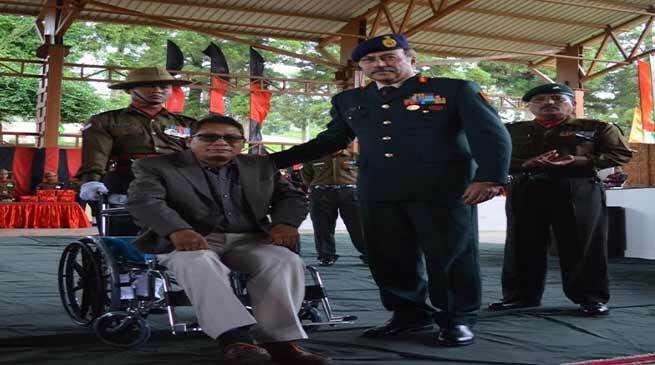 Veer Naris, War Veterans and handicapped brethrens were felicitated in a Mega Ex Servicemen Rally held at Shillong, the capital city of Meghalaya on Saturday. A Mega Ex Servicemen Rally was organised by Headquarters 101 Area and Rajya Sainik Board, Meghalaya at Assam Regimental Centre, Shillong on 26 May 2018. The rally was attended by more than 1100 Ex Servicemen, Veer Naris, World War II veterans, Widows and children hailing from Meghalaya. The rally was specially aimed at ex-servicemen, war veterans, disabled soldiers and war widows (Veer Naris) to express our solidarity and demonstrate that they remain inseparable members of the Armed Forces fraternity even post retirement. The rally was graced by Governor of Meghalaya, Ganga Prasad, Minister GAD, Comingone Ymbon, Chief Secretary, Y Tsering and General Officer Commanding, 101 Area, Lieutenant General DS Ahuja, AVSM apart from other civil and military dignitaries. The rally was addressed by Governor of Meghalaya, Ganga Prasad who lauded the Veterans for their services to the nation and assured them of all assistance from the Govt. Veer Naris, War Veterans and handicapped brethrens were felicitated during the event by Hon’ble Governor and Lieutenant General DS Ahuja, AVSM. As part of the Army’s “Year of Disabled Soldier”, General Officer Commanding, 101 Area presented mobility equipment to a handicapped veteran. A number of stalls from various welfare agencies and organisations of the Army were set up at the venue with a focus to resolve pension and entitlement related problems being faced by the Veterans and War Widows. A medical camp, fully staffed with Specialist Doctors and medicines, was also organised to address immediate health issues.